We went to the San Diego Low Speed Wind Tunnel with the objective of comparing our AeroJacket disc covers to uncovered wheels and disc wheels. The obvious advantage of racing with a disc cover is cost, however this data quantifies the performance advantage. A covered wheel has dramatically lower aerodynamic drag than an uncovered wheel. Disc cover performance is virtually identical to disc wheels through the entire range of yaw angles: 0-30 degrees. 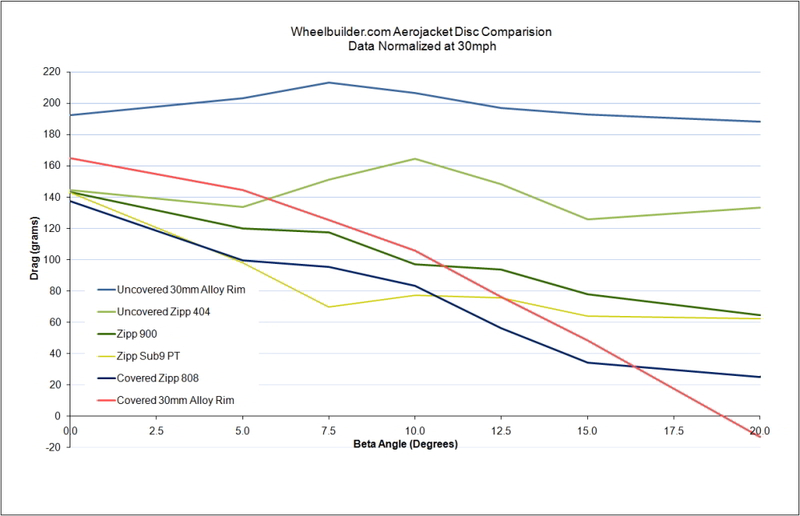 A covered 81mm deep wheel outperformed flat disc wheels in every wind condition. The covered Zipp 808 has less drag than the fastest disc wheel tested beyond 10 degrees of yaw. A typical 30mm training wheel with disc covers approaches the performance of a flat disc at 7.5 degrees of yaw, but exceeds performance of all disc wheels tested at wind angles greater than 12.5 degrees. The lens-shape on a disc-cover's non-drive side causes wind to pass around it like a wing, producing forward thrust. This effect is more pronounced on covered shallow wheels beyond 20 degrees of yaw. Drag on flat discs is nearly identical with wind traveling from rider's left or right sides. AeroJacket disc covers are asymmetric, with a flat drive-side and lens-shaped non-drive side, so drag differs depending on wind direction. The most favorable direction is with the wind traveling over the rider's right shoulder. For this reason we tested in both wind directions i.e., we ran the test forward and backwards and averaged the data. We ran the tests on the 30mm covered wheel (DT Swiss RR 585) twice on the advice of the wind tunnel staff who were, frankly, astonished by the results. Click here to purchase an AeroJacket! In evaluating race wheel performance, riders optimize aerodynamics, wheel weight and inertial forces. In triathlon and time trials, aerodynamics are overwhelmingly influential. On a flat course, 80% of your power is used to overcome wind resistance ("drag"), so improving your wheel aerodynamics has the most significant impact on racing faster. On flat or rolling courses, wheel weight is trivial relative to the dominant aerodynamic drag forces. Weight matters only when steep and prolonged grades are present. Covers weigh 350-400g, which is small by comparison to rider and bike mass. The weight is also evenly distributed around the wheel making differences in wheel inertia virtually imperceptible. Wheel inertial forces have less significance for steady state TT or Triathlon applications.